One of several conjoined lamb skulls from the NHM collection. Photo: copyright Isabelle Merminod, all rights reserved. 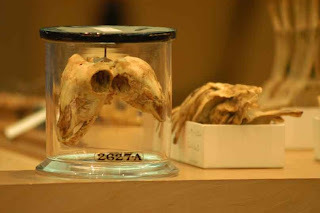 They look like gone-wrong GM experiments, or the products of chemical contamination or the fallout from Chernobyl, but many of the specimens in the Natural History Museum’s ‘anomalies collection’ are well over a hundred years old. This isn’t a collection as such, and is spread over the mammals collection, as ‘abnormalities fall outside taxonomy.’ The curators are careful to avoid tasteless sensationalism, but that’s how the museum started, as a ‘cabinet of curiosities’ assembled by the likes of Hans Sloan, founder of the British Museum, from which London’s Natural History Museum (NHM) grew. The mid-seventeenth century collection mania of the aristocratic “grand tour” set included collecting ‘oddities and abnormalities,’ and there were even Mediterranean cottage industries turning out fake prodigies in the form of altered skulls or tampered-with stuffed animals. Gradually, the cabinet of curiosities came to be arranged in a more orderly fashion, in a way supposed to reflect the organisation of the natural world. The freaks became an embarrassment and were relegated to the cupboards, eventually ending up in storage in the eleven-storey Mammal Tower at the Museum’s site in Kensington. Some of these prodigies were brought out for a rare public viewing at a well-attended one-off ‘Freaks of Nature’ lunchtime lecture event last December. The curators who presented them were clearly enjoying themselves. NHM Mammals Curator Richard Sabin told how he had been inspired to go into zoology by a childhood of Bank Holidays spent in the back of the car being driven by his dad, looking for a suburban museum where he was promised a two-headed pig. (They always got lost and never made it to see the two-headed pig before closing time.) “Now I get to work with a pig with two bottoms,” said Sabin, with some pride. While Sabin’s predecessors locked the freaks away, dispersed among the Museum’s three quarters of a million mammal specimens gathered over 250 years, the freaks have long been in constant demand for study by vets, looking for clues to ‘developmental defects’ in pets and cattle. The Museum’s collection of ‘polydactyl cat leg bones’ is a section of wooden board with the bones of the front limbs of several cats stuck to it. They have extra toes, some up to seven on each foot, ‘quite damaging to your sofa,’ comments Curator Daphne Hill. ‘Evidence for social interaction’ that accommodates deformed members of mammal communities could also be a force at work among North Sea white beaked dolphins. In the course of a century, the Museum has acquired sections of vertebral column from three different individuals of this two-meter long species of dolphin. The vertebral columns are ‘bent like the U-bend of a sink,’ giving the dolphins floppy spines. This was ‘something that developed in the womb’, but the dolphins that had this deformity were adults with full stomachs when they were found washed up on the beach. Either a floppy spine doesn’t matter so much when you’re buoyed up by water, or the pod of dolphins were organised to feed their floppy-spined members by driving shoals of fish at them. Sabin with floppy porpoise vertebrae. Photo: Copyright Isabelle Merminod, all rights reserved. Sabin also cast light on a possible explanation for some sea monster carcasses. He said that when whales decompose, their skin detaches as the outer layer of blubber rots away. The skin floats away, the skeleton in some cases come out of their mouths, leaving an indistinguishable “globster” mass. The Mammal Tower’s cabinets also house a stuffed cheetah from Rhodesia (now Zimbabwe) that, unlike normal spotted cheetahs, was striped along its back. It was found in 1927 and named as a new species of “King Cheetah.” Recently, an orphaned cub with the same markings was found, and it bred at South Africa’s Kruger National Park. It had one or two striped young; the others were normal spotted cheetahs. 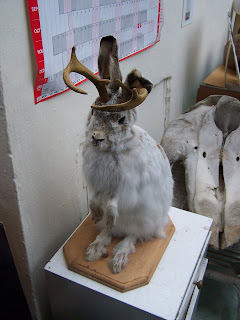 The collection also has stuffed Indian civets with anomalous white paws, and specimens of the Bull Island mouse. Bull Island is just off the coast near Dublin, and is a sand bank, which formed just over 200 years ago. Since then, mice that colonized the island developed a freakish sandy colouration, and it was such an ‘advantage to be yellow on a sandy island’ that the whole population is now sand-coloured. Some animal deformities aren’t the result of gone-wrong embryology, but of animals coping with disease or even accidents. Roe deer usually shed their antlers once a year. Antlers that – for whatever reason – don’t shed take on a weird form, like a shapeless mass of fuzzy, velvety coral. We were also shown a roe deer’s lower leg illegally snared on the Sussex coast. 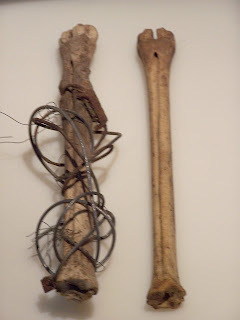 Wire had cut into the bone, but bone has grown over and around the site of the wire snare, the snare had been round the deer’s leg for at least two years when the deer died, of natural causes. It had lived a long time, it had a mature skull. The bone could have grown around the snare in under a year, ‘bone incredibly reactive material,’ Sabin explained. The newly-opened Wellcome Collection, also in London, has anomalous animal specimens including a two-tailed lizard, while the city’s Hunterian Museum at the Royal College of Surgeons has a truly stomach-churning collection of human foetal anomalies. Thanks to freelance photographer Isabelle Merminod for kindly agreeing to licence the use of her copyrighted photos for this site only. You can see more of her documentary photos on her website. Update (October 2012): I visited the Museum Nationale d'Histoire Naturelle in Paris, which is itself a museum piece dating from the days of Baron Georges Cuvier, the turn of the 19th century founder of comparative anatomy. In its truly stomach-churning hall of skeletons and pickled bits of baboon and so on, it has a little corner of conjoined twin births of calves and cyclopean kittens, among others. Mercifully, they're not the actual pickled freaks themselves, but painted plaster-casts of them, and they are at least 200 years old. The Museum being a temple to immediately post-Revolution enlightenment and the Age of Reason, there had to be a scientific point to its gruesome freaks display, and a didactic purpose to it for the edification of the masses. They found one - the freak plaster casts are divided into freaks "with an axis of symmetry" and "without an axis of symmetry". This Fortean Bureau of Investigation report from the December 2006 issue of Fortean Times (FT 217) appears as part of a general update of the site. 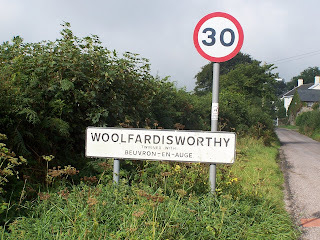 Just getting to the village of Woolfardishworthy, Devon, home of the Centre for Fortean Zoology (CFZ) and its Weird Weekend 2006 convention, was already beginning to look like one of the CFZ’s own expeditions to the ends of the Earth in search of unknown animals. Here’s a travel tip: be wary of any railway branch line that’s named after an otter. My journey along the “Tarka Line,” which (eventually) takes passengers from Exeter to Barnstable, became a two-hour nightmare wait, followed by standing room only in a packed carriage. The stress and tedium was relieved only by the tall man in the orange ponytail, with his loud and clear recitations from a battered copy of A Textbook of Marxist Philosophy. The “Tarka Line” experience was followed by a cross-country bike ride featuring a series of terrifying 1 in 5 gradients that dropped down sharp to disappear into dark, misty woods. Washed out at the campsite, I had my own cryptozoological encounter the next morning, picking strange yellow snails off my sodden bike. Down at the barn-like Woolfardishworthy Sports and Community Hall, posters for the young farmers tractor pull event shared noticeboard space with an exhibition of Bigfoot images. Fiancées, girlfriends and neighbours’ kids had been roped into helping out, including “Little Ross” the microphone runner, and 14-year-old David Philips who ran the Weird Weekend sound and lights. Highlights of the 12-hour endurance marathon that was ‘Weird Saturday’ included Chris Moiser from the Big Cats in Britain Group. The group made a Freedom of Information Act request for data on Big Cat sightings from all the UK’s 600-odd councils and 36 police forces. Devon and Cornwall Constabulary’s three-inch thick file of police logs revealed that the police force keeps a tranquiliser gun in its stores, and that many more sightings are reported to the police than to the press. Paul Crowther uncovered a local cottage industry in faked Big Cat photos. Richard Ingram’s talk on the fall of civilizations listed the usual catastrophes, and some unexpected threats – the financial markets leaving ‘The City’ would pretty much finish off Britain’s economy overnight, while a sudden epidemic could take out the very small pool of people who keep nuclear power stations ticking over. Ufologist Lionel Beer looked at several dozen potential locations for that “elusive historical butterfly,” King Arthur’s court at Camelot, and concluded that it may all be (literally) a load of rubbish, or a camelotte in French. UFO researcher Nick Redfern – one of very few people who makes a full-time living out of what he calls “the subject”, had flown in from the States to talk about “saucer spies” – Special Branch, M15 and RAF Provost and Security Service’s surveillance of ufologists in general, and his colleague Matthew Williams in particular. Redfern’s thesis is that the security services wrongly believe that ufologists are being used as cover by other “subversive” groups. Paul Cropper arrived after a 37-hour journey from Australia at his own expense to give two talks in an afternoon, pretty much straight off the plane. He showed rare footage of a purported Australian black panther, and footage of a mainland thylacine, (Tasmania tiger) which we all agreed looked very much like a fox – an animal introduced to Australia to keep down rabbit numbers, and which quickly went feral. Goth zoologist and former head zookeeper for reptiles Richard Freeman reported back on the CFZ’s Gambia expedition in search of two elusive beasts – “Gambo”, a finned, crocodile-like carcass found washed up on Bungalow Beach and buried in the dry sand by holidaying missionary Owen Burnham in 1983, and “Ninka Nanka” a huge, swimming crested serpentine dragon that makes you drop dead within five years of seeing it. Bungalow Beach is now heavily developed, and the team quickly found that after more than 20 years the sand had become too wet to preserve any Gambo bones. Witnesses they interviewed describe something very like a large dolphin. The expedition found only one living witness to the Ninka Nanka, who claimed a witch doctor saved his life after his sighting, but even then he still lost his hair. Others told how relatives had seen it and then died. Some reports described a “fantastic, Godzilla-sized” animal. A story about a lorry crashing after running into a huge furrow left by a slithering Ninka Nanka in 2000 didn’t match the wreckage of a much older-looking, rusty wreck with trees growing through it. Alleged Ninka Nanka scales were passed around the audience. We agreed they were probably mica chips. Mr Freeman concluded that if there is a Ninka Nanka – maybe a large, crested or combed swimming snake – it has died out in Gambia, and we will have to look for it over the river in more remote Guinea. 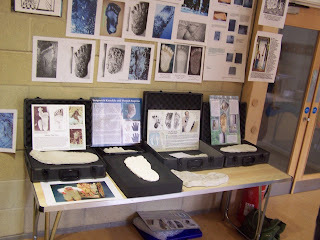 Paul Vella, of the Alliance of Independent Bigfoot Researchers, set out a stall laden with Bigfoot footprint casts and photos of more Bigfoot prints. Mr Vella is a UK-based crime scene investigator specializing in computers and mobiles, but his interest in Bigfoot was kicked off by the Patterson-Gimlin Bigfoot film – 40 years old next year – “it really bugged me.” Mr Vella asserts that, Patterson aside, “nobody makes any money out of Bigfoot… a lot of people spend a lot of money on Bigfoot research” and he knows of “five Bigfoot-related divorces. It consumes you.” He has promised his wife he will give up his research in 2010 and put all his Bigfoot books on E-bay. 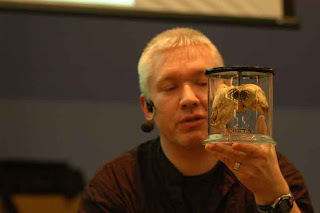 He presented convincing evidence for Bigfoot being real – prints, casts, and spine-tingling recordings of Bigfoot screams, which he played to us. He has heard rumours that logging interests were behind some obvious Bigfoot hoaxes in a conspiracy to stop their patch becoming a logging-free Bigfoot reserve. Coghlan’s goatman turns out throughout Europe – Pan and the Satyrs of Greece and Rome, the Danish geetman, the Scottish urish, and the nastier German bokschit. Pan is far older than the gods of Olympus, and was originally part of a whole race of Pans. Modern American legends – like the axe-wielding, murderous goatman of Prince’s County, Virginia – superimpose gone-wrong genetic experimentation nonsense onto older spooky campfire stories. 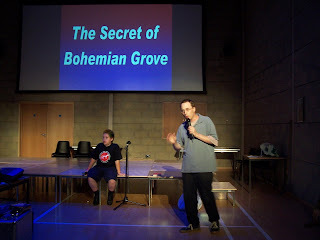 If you missed the Weird Weekend talks, you can still see highlights on CFZ TV, accessible via the CFZ website. Weird Weekend was also a chance to visit the CFZ’s new headquarters at Myrtle Cottage, Back Street, Woolfardishworthy. 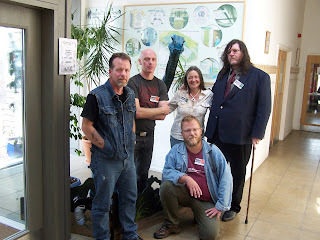 The new office was as busy and crowded as my carriage on the “Tarka Line” when I visited, and the conservatory featured a jackalope, a pilot whale skull connected to the Mogwar sea serpent legend, and live snapper turtles and soft-shelled turtles, some of which came the CFZ’s way following Customs seizures. Cuthbert, one of their soft-shelled turtles, is the only known example of a newly discovered species. Mr Downes rounded off by promising more CFZ expeditions soon – to Orange Country, Texas, in search of a mystery “double-bed sized” snapping turtle, a trip to look for mystery lizards on uninhabited islands in the Canaries, a second Mongolian Death Worm trip, and an expedition to find “the world’s largest earwig” in the South Atlantic on St Helena – the island of the giant insects. 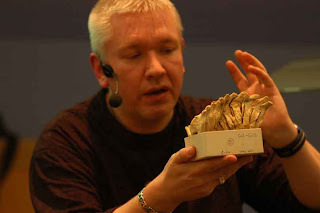 Veteran Fortean John Michell is among the speakers already booked for Weird Weekend 2007, back in the Sports and Community Hall on 17th-19th August. Over dinner in the Farmer’s Arms pub afterwards, eating from a cryptozoology-themed menu that included Beast of Bodmin Steaks, Mr Downes promised the next Weird Weekend would also include Morris dancing and a parade by the local village kids dressed as monsters. “A bit like in The Wicker Man, or like one of those strange villages coming out of the mists in Hammer House of Horror?” I asked. UPDATE: The local Morris team were unavailable for Weird Weekend 2007, and the proposed children's fancy dress monster parade turned into a Chinese-inspired dragon dance at the opening ceremony and a youth cavorting in a gorilla suit during a rendition of "Hunting The Bigfoot" by a local teenage band.